The novichok packaged as perfume was revealed after a few days to have been found in a bin behind a charity shop. Charlie Rowley had difficulty with his memory for a few days, which is be a side effect of nerve agent poisoning. Thank you! How charity bin is working - people are supposed to put redundant belongings\donations in it to be later distributed by Church or NGO to those in need? In the USA it is called dumpster diving. That explains why it was not found by police. Thats right. It was also found in a location previously unconnected to the attack, far closer to the centre of the city (actually, not that far from the cathedral) than it was the Skripals house or even the railway station. Work has continued on the dismantling of Novichok victim Sergei Skripal's home as authorities continue a deep clean to eradicate any potential traces of the poison. Neighbors have been warned that the work could take up to four months as a team from a chemical, biological, radiological and nuclear unit complete the clean-up. After being taken apart, the property will be rebuilt once the deep clean is finished. Today members of the military were spotted outside the house dismantling the roof and bagging up parts of the windows. The workers, dressed in camo and wearing face masks, wrapped pieces of the boarded up house in clear plastic and walked them to an area next to a white van. Mr Skripal, 66, and his daughter Yulia, 33, were exposed to the substance in the city last year but survived the chemical attack. Detectives believe the pair first came into contact with the poison when it was sprayed on the door handle of their property in Salisbury. The decontamination project is being led by the Department for Environment, Food and Rural Affairs (Defra) but military teams will carry out the work, a Ministry of Defence spokesman said earlier this week. This will be the same team involved in the clean-up so far, from the chemical, biological, radiological and nuclear unit, he added. The clean-up has been taking place ever since the Skripals collapsed on March 5, but work paused over Christmas. The next, more extensive phase of the operation was due to begin on January 7, according to a letter written by Wiltshire Council. Dated January 4 and signed by the council's director of public of health, Tracy Daszkiewicz, it told residents that contractors would spend the first month erecting scaffolding to cover the house and garage with a 'sealed frame'. Edited by Stuart Galbraith, 13 January 2019 - 0310 AM. We do have charity bins, usually at supermarket exits for people to fonate. Those are handed to charities who distribute food parcels, primarily to chancers who spend their dole money on vodka and weed rather than on food for their spawn. Apart from that, charity shops sccept donations of goods, typically books, clothing etc. for resale. These tend to be Oxfam-like charities, medical research charities or for hospice care of various types. Dumpster diving is generally used when talking about garbage bins, or skips of stuff for disposal, not for disbursement or resale for charity. As has already been mentioned, this type of waste is still legally property, so dumpster diving is technically theft. For example. I recovered two working fluorescent light fittings and tubes from a skip outside my old place of work. They had been put there illegally by contractors working on the plot next door. I still asked our building services if they were ok with me taking them, on the assumption that they became "ours" when dumped. 1)clearly marked\promoted as this to promote people bring in things - so it is strange for "agents undercover" to throw anything into it as it will be at least examined by somebody when distributed? 2)As potentially valuable property, it is logical for it to be "guarded" by at least CCTV looking at it? No. A bin behind a charity shop would be for waste disposal. When people take stuff to a charity shop, they usually do it when it's open, so it goes inside directly, or in bags they leave outside the front door. I duspect that public lisbility would prevent any kind of unmediated rummage bin. As far as I know, everything that goes into a charity shop for resale is assessed for fitness. I've not seen second hand perfumes for sale in sny duch shop - I suspect liquids and food item donations are forbidden for liability reasons. So it was not charity bin but simply waste bin standing next to charity shop? That would be my inference, yes. A charity shop is not for for issue to people in need. That would be more accurately food banks. A charity shop is stuff brought in by the public bric a brac, what have you, that is held in the shop and sold, and the proceeds go to charity. So anything that doesnt sell, THAT goes in the bin. The only problem is, I saw one source from a newspaper that claimed the shop was not actually open at the time. Which if its true suggests why the item remained in the bin for some time before Charlie Rowley collected it. The bin was evidently never put out for collection for several months, whatever the reason for it was. Anything that goes in the bin is junk. Its not valuable necessarily, but till its removed its still property. Apparently Charlie Rowley and Dawn Sturgess made a habit of it, and it is seemingly popular in some parts. Ive found some good stuff in charity shops. I bought a US Army hardback book on all the worlds weapons from 1952 from a charity shop in Keynsham. A local newspaper claimed someone once bought a suitcase with vaguely secret plans of a C Class nuclear attack submarine. Supposedly they originated among dockyard staff. Edited by Stuart Galbraith, 14 January 2019 - 0808 AM. What the hell kind of Government conspiracy bring's the Army's most senior medic at the scene and she decides to bring her 16 year old daughter along? Its kind of like Lee Harvey Oswald bringing his child along on kids at work day, dont you think? No, its not up to you to answer, but it IS up to you to raise the idea of some kind of conspiracy, even though its self evidently absurd. She brings her 16 year old daughter along to perform CPR at a Government created conspiracy? WTF? This is from back in December, and actually shows the British public see Russia with more concern than the British Government does. 60 Percent now see Russia as a posing a considerable or moderate threat to the UK. 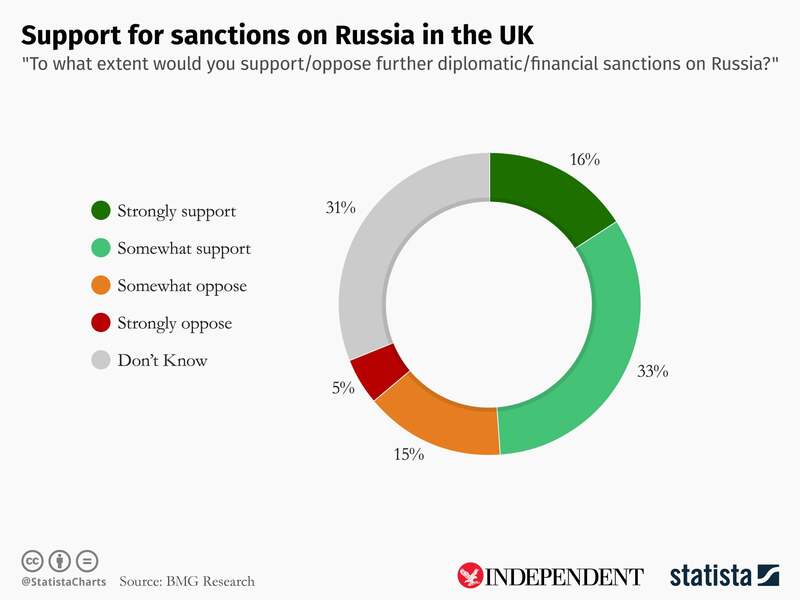 And 49 per cent of the British public support the introduction of new diplomatic or financial measures against the Kremlin. Sanctions and diplomatic expulsions levelled at Russia appear to have done little to deter its activities either internationally or on UK soil, where GRU intelligence agents are accused of causing a woman’s death and poisoning four other victims with novichok. Britain and allies expelled dozens of Russian diplomats over the attack, while the UK is introducing legal powers to stop, search and detain people suspected of “hostile state activity” at its borders. New unexplained wealth orders, which force subjects from outside the European Economic Area to reveal the source of their cash, are also expected to hit Russian oligarchs and organised criminals. Russians have also been the biggest beneficiaries of “tier 1” investor visas, which allow anyone investing at least £2m to work in Britain and expedites leave to remain applications. The government had admitted the “golden visa” scheme had been exploited for money laundering and serious organised crime and announced its suspension earlier this month. However, without explanation, the programme has since been allowed to continue, although the Home Office insisted it was committed to “reforming the route”. Critics have accused the current government and its predecessors of putting commercial interests above national security with an alleged reluctance to hit flows of Russian cash and trade. Polling for The Independent showed that 60 per cent of people believe Russia is a threat to the UK, but 28 per cent thought it was only a “slight threat” or none at all. For example, it can't be ruled out she was not told what kind of operation it is and that it IS the operation - but just given advise to be at certain location at certain time. Is it possible it is coincidence? Surely it may be coincidence, but every next coincidence is adding to doubts. Who knows. It is not more conspiracy then claims two people of different age, gender and size collapsing at the same bench hours after contacting door handle (and after visiting two pubs). Edited by Roman Alymov, 21 January 2019 - 0853 AM. In Russia, everything is a conspiracy, right? I bet if you find one of your sock's missing in the morning you blame it on MI6, am I right? I lament for poor Putin that so many of the people that oppose him end up dead. It must make him wake up in the middle of the night crying, wondering why fate could be so unkind to him. Once is unfortunate. Twice is a coincidence. 10 times (13 if you include the Skripal attempted assassination's and the death of Dawn Sturgess) is pushing the boat out. I know, its all a complete coincidence. I should just stop thinking and go to sleep in the snow like everyone else. Edited by Stuart Galbraith, 25 January 2019 - 0622 AM.